Most media reports on the opposing sides in the debate over fracking characterizes it as being between opponents and proponents. It generally relates the environmental concerns of the opponents, and the economic “benefits” the proponents seek from fracking—while doing a remarkably poor job of relating even the process of fracking to the readers, let alone the merits of either argument. In fact, most of the argument used by the proponents is usually rhetorical and heavily weighted toward ad hominem attack on the opponents in an attempt to characterize them as wild eyed lunatics who rant about the issues in an information vacuum. Nothing could be further from the truth, so let’s examine the debate from both sides. First though, lets look at the failure of the media to adequately explain just what fracking is. When the media describes fracking for its readers, the process is typically described as injecting huge volumes of chemical laced water, frack fluid, at high pressures to force gels and sand into shale and other low permeability rock strata to release the natural gas trapped inside the rock. If this were so, only the gas at the end of the tubing (the steel pipe laid into the well bore as a conduit for the gas) could be extracted. This description leaves out one very important part of the technique, the explosive charges detonated along the lateral tubing that is necessary to shatter the tubing and shale or other strata into which the frack fluid will be pumped. While academia and the scientific community have recognized the potential for these explosive charges to open fissures through which rogue methane and the toxic chemical laced frack fluid can migrate, mainstream media has not covered the science. The one article to address the issue of permeable strata that appeared in what may be called mainstream media, “Fracking question of policy, morality,” written by Pat Munday, Department of Geology, Montana Tech University, was published only in the Montana Standard. These are the kinds of articles and reports environmentalists use in debate with proponents of fracking. Calling them proponents is however a mischaracterization, albeit not a dishonest one. It simply fails to put them into their true context. They are anti-environmentalists. While anti-environmentalists will lock onto anything that sounds like science, it is very often the “science” presented by the industry—which usually seeks to target the environmental impact of mining rare earth minerals in China, and the resulting contamination, but which is also a deliberate lie in the context of its use. One such deliberate lie, “Methane in Pennsylvania water wells unrelated to Marcellus shale fracturing” [PDF], was used by Lisa Molofsky et al, an environmental geologist at GSI Environmental Inc., an environmental-engineering consulting firm in Houston, and published in Oil & Gas Journal. The report was subsequently used by Cabot Oil & Gas Corporation to “disprove a Duke University study that had linked fracking to contamination of water wells in Dimock, Pennsylvania. The revelation of the attempt by Molofsky to minimize the presence of thermogenic gas, the deep gas brought up by fracking, in the sampling required assiduous reading and deconstruction of the GSI report, and was detailed in an earlier post on Cynics and Charlatans. A follow-up on the theme of that blog post further addressed the true nature of the underlying motivation of the anti-environmentalists—the love of money. Money, their love of it, is in fact the only fact-based argument they have—but even the economic boon they argue it affords our ailing economy has come into question. Fracking is in all likelihood a last-ditch effort of an industry that has little other resort to producing its product if it is to survive. Moreover, drilling is an extractive industry that rolls into town one day, and moves on to the next site after the well is in. Then, as gas production rose to a fevered pace, the gas glut began to take its toll as well, seriously affecting the profitability of fracking. Other economic factors, like the effect of fracking on property values, are another consideration far from view of the industry, and not at all any of their concern. In theory, the “shale boom” was also thought to be a magical process through which gas money flowing into communities and relieve the stresses of the economic fortunes of communities. Not only are all the promised jobs not being delivered in every location, but reports show that the stress on infrastructure is laying communities to waste. 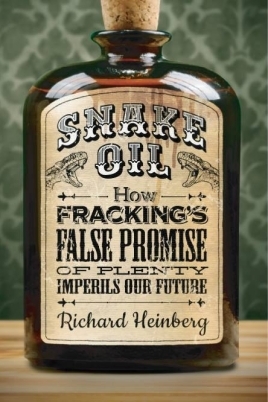 Richard Heinberg’s latest book, How Fracking’s False Promise of Plenty Imperils Our Future, provides an in-depth look at the failed economic promise of fracking. The benefits to local economies is also questionable. Most people forget that one industry’s gain usually results in loss by another, such as the decline of the economies of coal mining towns following the switch by electric utilities from coal fired plants to natural gas. Meanwhile, property values in areas where fracking is taking place are threatened by the unwillingness of insurers to underwrite home owner insurance. Whereas environmentalists most often use reports on sound scientific research, they sometimes use overreaching data that can be criticized by anti-environmentalists, as in this report on Energy in Depth, a cog in the industry funded disinformation machine. However, most environmentalist use reports like the one that discovered a fracking related case of contamination by the EPA dating back to 1987. Or they may reference reports about industry executives who are willing to be candid about the risks, including George Mitchell, the pioneer of extracting shale gas economically. Yet, the anti-environmentalist disinformation machine continues to grind out the same falsehoods, and use ad hominem attacks on environmentalists. This is evident in public forums as well, like the FrackNation page on Facebook. In a remarkable twist of hypocrisy, the accusation that environmentalists argue in a void of scientific evidence is one of their favorite attacks. Tom Shepstone, a truly scurrilous charlatan, a “political organizer” for Energy in Depth (EID—another cog in the industry disinformation machine), also publishes one of the most vapid ad hominem attack blogs aimed at discrediting environmentalists, Natural Gas Now. Additionally, his blog reaches mightily to discredit environmental organizations as being money machines that buy influence to the glee of the anti-environmentalists. Almost across the board, other dissemblers, like this frequently published piece by Deroy Murdock, a Fox News contributor, appear throughout both obscure and mainstream media outlets. Aside from perpetuating the disinformation about fracking, the key feature of their articles invariably used ad hominem. A prime example of the use of ad hominem, disinformation and sundry other dishonest rhetorical argument can be found on The Motley Fool, in an article entitled “A New Back-Door Attempt to Thwart Fracking.” The piece is a less vapid and somewhat less rabid assault on the truth, but no less void of any quality that makes it worth considering in the dialog over fracking. Absolutely not! 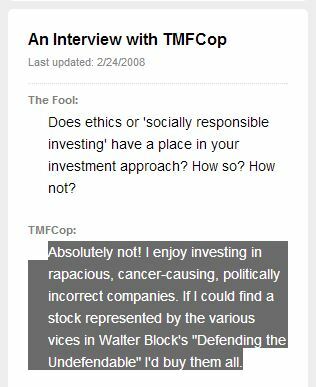 I enjoy investing in rapacious, cancer-causing, politically incorrect companies. If I could find a stock represented by the various vices in Walter Block’s “Defending the Undefendable” I’d buy them all. It’s not just the “hired guns” writing the disinformation pieces who lie. Many others even betray public trusts (Facebook post—you will need to be logged in to see the post) because they simply can’t make a living on their land—all for the sake of money. Whether an industry participant, a land owner or hired gun, simple greed (Facebook post—you will need to be logged in to see the post) is the primary motive. The mounting body of evidence that fracking threatens the environment is so significant that only those who have no regard for the injury it may cause to others could possibly be proponents of fracking. But they obviously feel that being an anti-environmentalist serves them well. Kansans, beware! Kansas Strong (KS), yet another industry funded cog in it’s disinformation machine, is not being honest about fracking. Aside from the fact that unconventional drilling—sending out horizontal bores after drilling the vertical bore into the strata being fracked—has been employed in fracking for less than a decade, it’s just not true that there are no “legitimate” complaints. The first documented case of environmental damage dates to 1987, and significant other evidence substantiates the legitimacy of the complaints. Most have been covered up, principally through settlements that required the injured parties to sign non-disclosure agreements. Some were covered up through challenges to the findings of investigations, like the problems in Dimock, PA, and political pressure on the EPA to drop their investigation. On careful reading of the Cabot Oil & Gas’ challenge to findings that fracking caused methane to migrate into the water supply, it also becomes clear that Cabot’s own “scientists” admitted that thermogenic gas—the kind found in the shale being fracked—was present, and their hirelings just tried to dismiss it as being irrelevant. There are in fact few in the industry who are willing to be honest about fracking, and their tactics are appalling. Curiously, one among those who are inclined to be honest include George Mitchell, the man who developed the process of fracking. The issues related to fracking are not confined solely to the potential for environmental damage related to drilling. The most serious relate to accidental discharges into surface water, and intentional disposal of toxic chemical laced waste water, and highly radioactive waste—both solid and and liquid—by unscrupulous drillers and their contractors. Other problems in addition to these are documented on FracTracker, and reported on daily on the No Fracking Way! Facebook group. Kansans would be well advised to keep pace with the mounting body of evidence related to the dangers of fracking by visiting these Web sites, and telling KS to frack off! Other recommended resources include: Snake Oil: How Fracking’s False Promise of Plenty Imperils Our Future, an investigation into the myth of energy independence and economic claims made by the oil and gas industry; and Phelimites and Other Gasholes, a Facebook page devoted to exposing the industry lies, and presenting the latest news and reports on the truth behind the veil of deceit used by the industry.